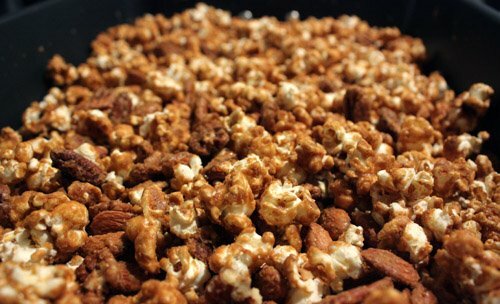 A couple of cool weather nights got me thinking about how caramel popcorn spends a long time drying in a warm oven and how good the lingering aroma is. Many, many years ago, when I went trick-or-treating, there was one house that always handed out little bags of homemade caramel popcorn. I’d love to offer homemade treats to the kids, but I don’t think their parents would let them eat it unless they’re friends of ours. So, I made some caramel popcorn and brought it into the office instead. Sadly, but typically, I couldn’t remember what recipe I used the last time I made some. 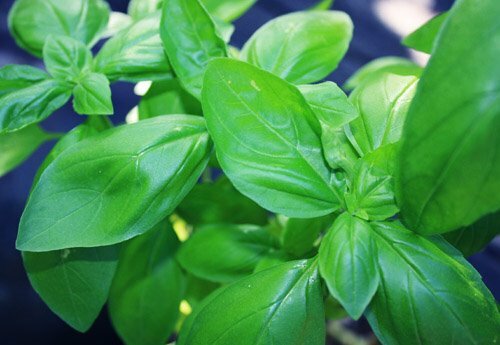 This blog will come in handy for future recipe recall. I searched around, took inspiration from a few sources, tinkered with ingredients a bit, and came up with what you see here. 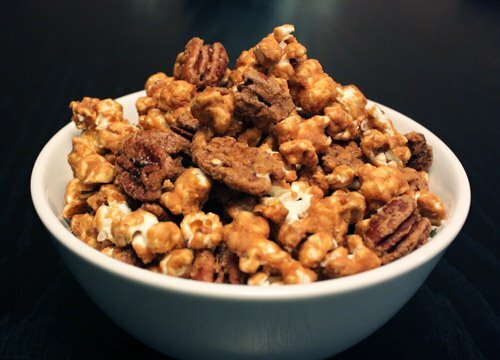 Of course, I can’t resist sea salt with caramel, and cayenne is ending up in everything I cook lately, so if you’d prefer strictly sweet caramel popcorn, skip the cayenne and final salt sprinkling. I left a big bowl of this in the kitchen at work, and it was scooped up throughout the day. Some folks were delighted by the tiny kick of heat, some didn’t seem to notice, but everyone came back for more. 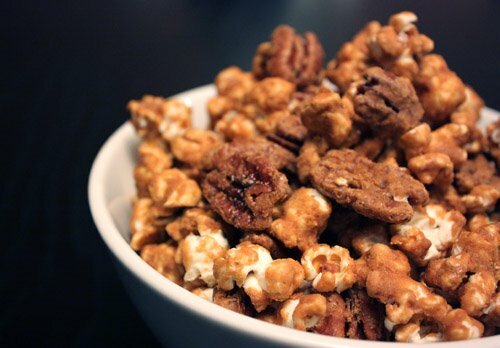 The cane syrup brought about a deeper-flavored caramel than corn syrup would, and the nuts added their own appeal. This recipe is in the permanent file now, and next time I’ll know where to find it. 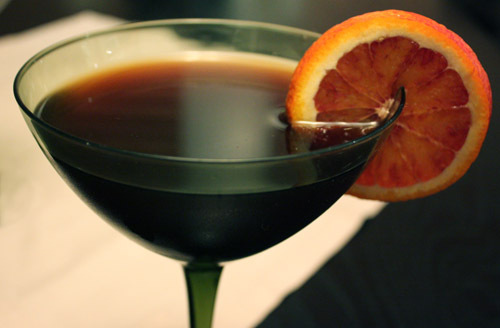 Blood orange slices add a nice touch of color, and their name even sounds Halloween-oriented. Given the amount of alcohol per martini, they surprisingly lack harshness as the Kahlua performs well in smoothing out the edges. Can I say it’s hauntingly good? Too easy. Mysteriously enchanting? No. 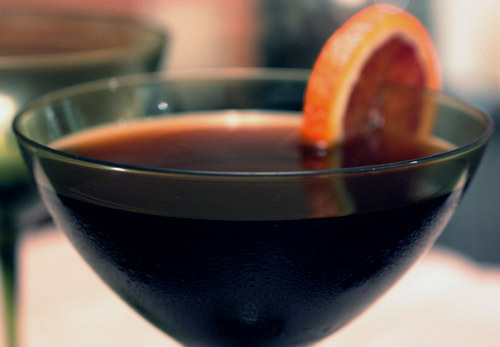 But, it’s Halloween, and this is a great cocktail, so give it a go. I don’t think I can refer to these as cookies, and they’re not quite granola bars either. 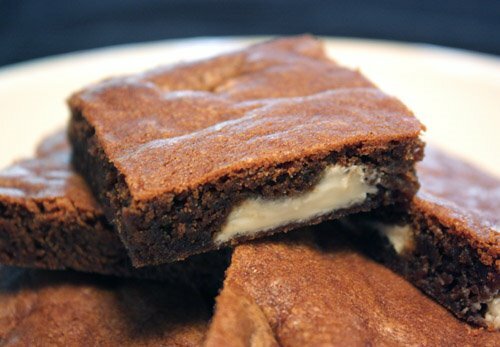 They’re healthy snack-type cookie bars, and they came from Living’s October 2004 issue. Several years later, I did at least make them in the month of October. The nuts and fruit could easily be changed out to suit any craving, but I went with the suggested dried apricots, pistachios, and sesame seeds. One change I did make was using all honey rather than a combination of honey and refined sugar. The quinoa is the main character here with its own nutty quality, but it needs to be completely dried in the oven to work well. 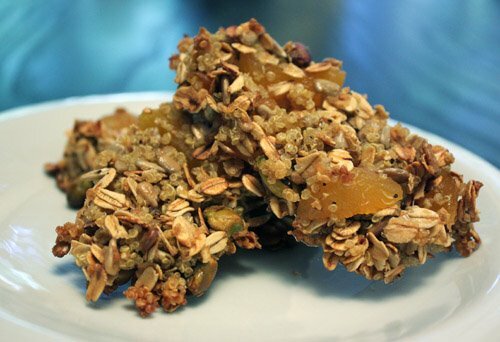 The instructions state that you should spread the quinoa on a baking sheet and bake for 30-35 minutes fluffing with a fork occasionally. It sticks a little at first but less so as it continues to bake. 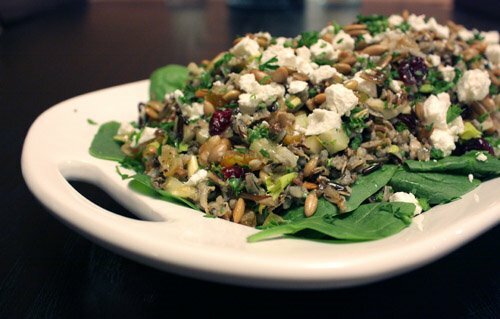 To speed up the next steps, the oats and sesame seeds can be browned at the same time the quinoa is in the oven. Once all the ingredients are combined, the resulting mixture is a little runny and messy, but it comes together and crisps up during baking if baked as directed. I formed some clusters into oblong, oval bars, and any shape would work. However, one thing that doesn’t work is baking the mixture in a small pan. I had thought I could bake some in an eight inch square pan and then cut tidy bars after it cooled, but no. The pan-baked version didn’t become crisp throughout, so forming individual clusters on a baking sheet is the way to go. The ones that were made properly were crunchy and delicious. It’s recommended that the cooled clusters be stored loosely covered with foil. They do lose some crunch if stored air-tight, but re-warming them in the oven would revive their crispness. It occurred to me that the addition of some cinnamon or nutmeg would be nice, and next time I’ll definitely give that a try. As they were, they made a guiltless, nutritious, and tasty snack. The cayenne in the vinaigrette met the sweetness of the dried fruits nicely, and the celery and parsley brightened the mix. The pale, green, inner celery stalks with leaves attached are the best. 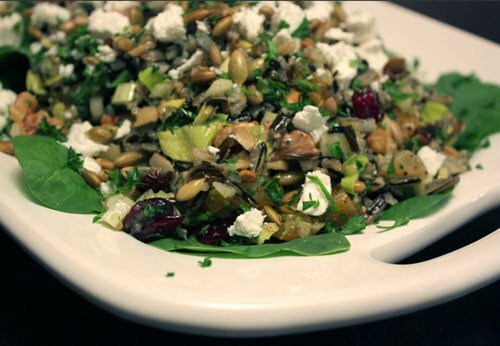 I was happy with the combo of cranberries and apricots, and the walnuts and pepitas worked well with the nuttiness of the wild rice. At last, I've found the elusive Thanksgiving salad. 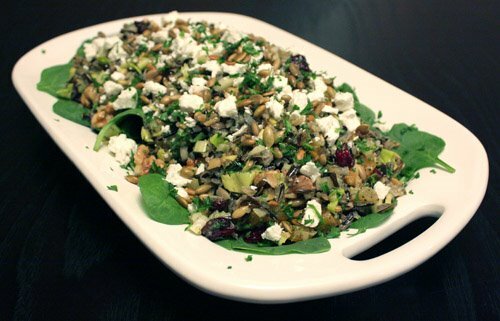 This salad experiment was performed simultaneously with an Oktoberfest beer tasting. First up was Sierra Nevada Harvest. Here, the flavor was all about the hops. The second, and our favorite of this tasting, was Ayinger Oktoberfest-Marzen. 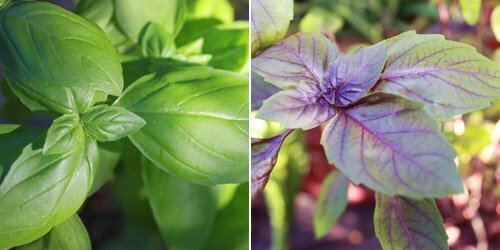 Rich, full-flavored without being too heavy, it had a smooth, evenness that we will definitely return to throughout the season. And, some trivia: Oktoberfest beers are brewed in March to be ready for fall festivals, hence the appearance of Marzen on labels. 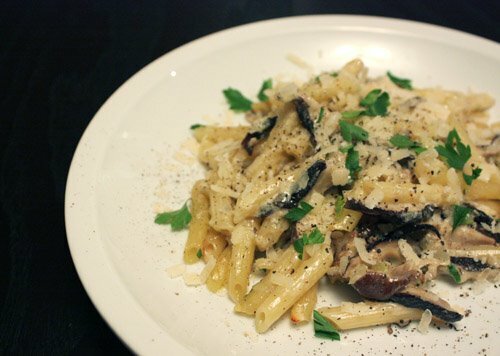 Pasta, mushrooms, and cheese is one of my most favorite combinations. 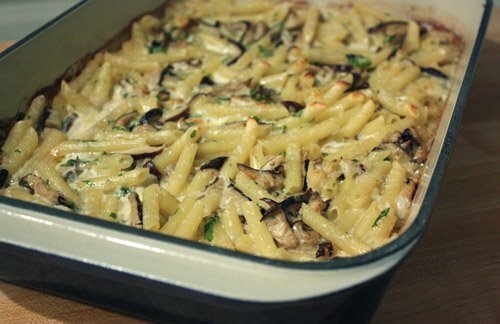 Regular criminis, any old pasta, and domestic parmesan would make a very satisfying meal for me, but elevating it by using local, organic shitakes, organic cream, premium pasta, and excellent quality parmigiana reggiano makes me a very, very happy diner. So, this meal had no chance of disappointing, but I’ll go further and suggest that there isn’t a bad pasta dish to be found in the book I was using. I’ve written about it before and I’m sure I will again, because everything I’ve cooked from it has been outstanding. In my opinion, On Top of Spaghetti by Johanne Killeen and George Germon can do no wrong. I’ve never visited Al Forno, but I would consider purchasing a ticket to Providence, RI just for that purpose. 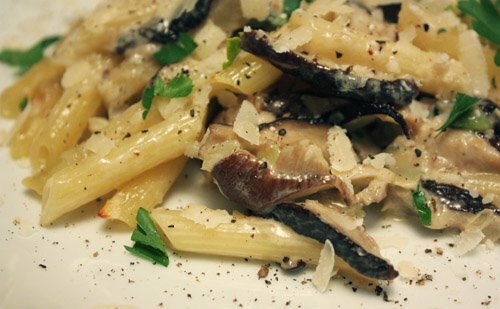 In the book, this dish is found under the title Ziti Baked with Mushrooms, Cream, and Parmigiana Reggiano. I found skinny, little pennette that I couldn’t resist and used that instead. Other than that, I made two small changes to the recipe. To the sautéed onion and shallots, I chose to add garlic. Then, the fennel and mushrooms joined the sauté pan with fresh bay leaves, parsley, thyme, and marjoram. I omitted the mint as I often do. My fall herb garden is beginning to take shape, and all but the parsley came from it. Once the mushrooms are cooked, a liberal portion of cream and the parmigiana were added. Half cooked pasta and a little pasta water were stirred into the mix, all was transferred to a baking dish, into the 500 degree oven it went for all of 10 minutes, and dinner is served. Upon tasting this, Kurt inadvertently performed the climax scene of every food tv show by tilting his head and murmuring mmmmmmmm. But, he meant it. How could he not; it was warm, melty, and richly satisfying. The fennel had cooked down to its mellow, sweet state and served to round out the character of the onion, shallot, and garlic. The mushrooms’ earthiness interplayed with the parmigiana as perfectly as it always does. This certainly didn’t need any additional embellishment, but if my bottle of truffle oil hadn’t been empty a drop or two would have been sublime. These buttermilk biscuits are from The Taste of Country Cooking and were part of the meal that I discussed in a guest post on Cooking Books. If you haven’t had a chance yet, take a moment to read that post and check out the fantastic Cooking Books site. 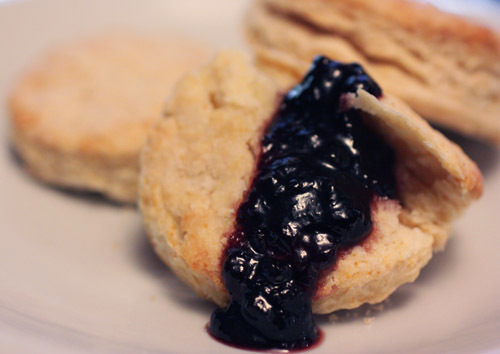 When I read The Taste of Country Cooking , I noticed that almost every meal included biscuits or rolls served with homemade jelly or preserves, and that reminded me of how, years ago, my Mom got me hooked on putting jelly on leftover biscuits for breakfast. Biscuits with butter are wonderful things unto their own, but biscuits with sweet jelly provide a different experience all together. So, when I was choosing dishes to prepare from the Fall chapter of Taste of Country Cooking, biscuits simply had to be included. 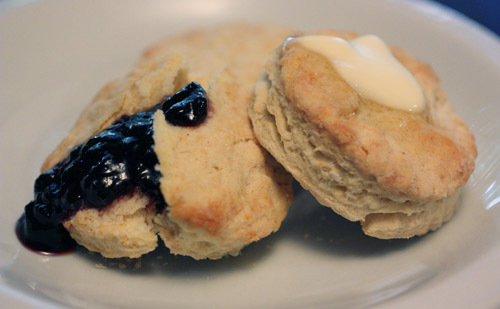 The ingredients used here are pretty typical for a buttermilk biscuit. The difference is the thickness. These were rolled out to 1/4 inch and cut into two inch rounds. I usually roll out biscuit dough to about 3/4 inch or so. They were baked in a 425 degree oven for about 10 minutes. Inside, they are as delicate as can be, and the tops and bottoms have just a slight crunch making them even more delicious than you’d think was possible. Hot out of the oven, we sampled one with just butter and one with blackberry preserves. I would have been very full of biscuits by the time I chose a favorite, so I declared them both winners. These biscuits are buttery and flaky with that nice, tart touch from the buttermilk which makes sweet preserves such a lovely counterpoint. Whether you partake of the jelly or preserves on your biscuits during the meal, after the meal, or for breakfast the next morning they’re equally good and well worth the effort of baking them. One of the great things about being a part of the food blogging community is seeing that I’m definitely not alone in the culinary-crazy department, and I say that with all due respect. I know I’m not the only one who could be perfectly happy spending an entire afternoon in the cooking section of a book store or in the kitchen chopping, slicing, sautéing, and searing. A few weeks back, I online-met Andrea at Cooking Books and learned we have in common an interest in food writing, cookbooks, food history, and cooking in general. She writes about her collection of books and prepares amazing dishes from them. I’m sure that our collections overlap, but recently, she’s been writing about and cooking from books by Sara Foster, Laurie Colwin, and Paula Wolfert; none of which are on my shelves. Clearly, there’s always more to learn. Or, the monkey’s always on my back, either way. I was thrilled when Andrea invited me to write a guest post for her blog, and I’ve finally chosen a topic. I read The Taste of Country Cooking awhile ago but hadn’t cooked from it yet, so I chose a meal from the Fall chapter to prepare and discuss. Visit Cooking Books to read all about my first experience roasting a pheasant, and enjoy all of Andrea’s fantastic posts while you’re there. Andrea has made this a new monthly feature on her site called Off the Shelf. It will showcase a different blogger and a book of his/her choosing each time. I can't wait to check in each month and find out what other people have been reading and cooking. 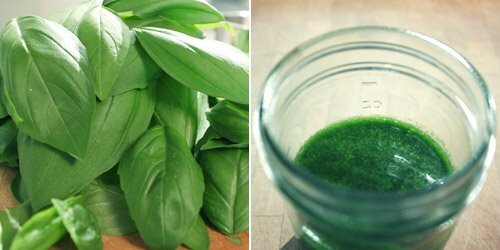 The basil oil I mentioned on Friday was used in Saturday morning’s breakfast. I’ve been reading the October issue of Saveur, which is all about breakfast, and I was inspired to cook up a hash and top it with fried eggs. This dish doesn’t appear in the magazine, but all the breakfasts mentioned had me craving a big morning meal. 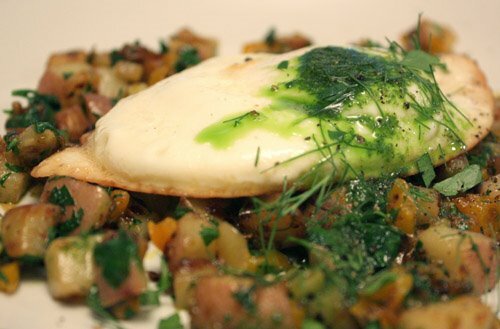 Thinking about a hash, I wanted to create something with a varied mix of vegetables and not just a potato dish. Fennel and orange bell pepper were diced small and added to the potato and onion. I left the hash to cook over medium heat for about 20 minutes until it was very tender. The fennel, potato, onion, and pepper all took on a similar texture and the flavors were well-melded. I used a generous amount of Aleppo pepper which brought some good heat to the dish and balance to the sweetness of the onion and fennel. At the end of the cooking time, a big handful of chopped parsley brightened it all. 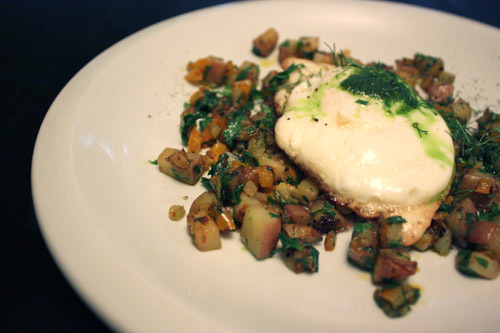 The hash was served with a fried egg on top, a drizzling of basil oil, and some fennel fronds. 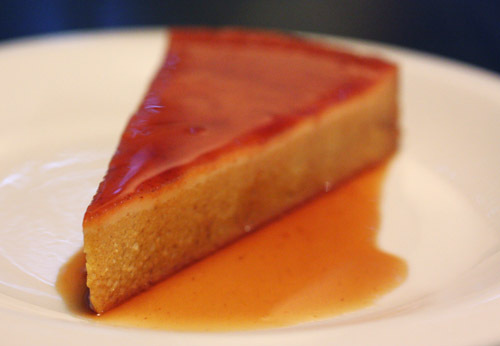 On Monday, I mentioned a celebratory dinner party and went straight to discussing dessert. Today, I’ll backtrack and describe the hors d’oeuvre course. 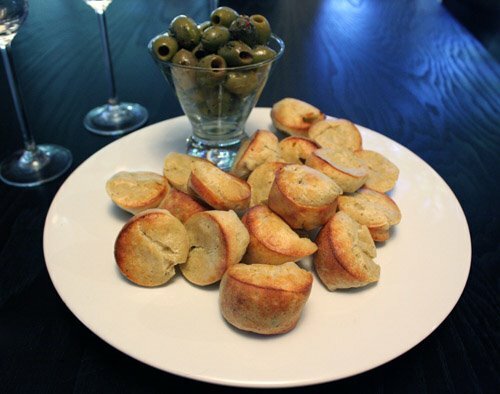 We toasted with a Louis Bouillot blanc de blancs sparkling wine and whetted our appetites with blue cheese popovers and herb-marinated green olives. 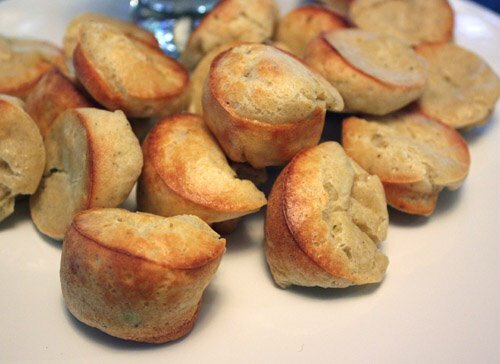 I found the mini popovers in Martha Stewart's Hors d'Oeuvres Handbook . I’ve used this book many times over the years and have come to depend on it. The chapters are organized by shapes or styles such as skewered, stacked, or stuffed. There are meat, cheese, and vegetable options throughout, and several of the spiced nut variations have become perennial, holiday favorites of mine. The genius of these popovers is that the batter needs to be chilled before it’s baked so it’s not just convenient but also necessary to make it the day before. I crumbled a Roquefort cheese as small as I could into the milk and melted butter batter which sat in the refrigerator overnight. Unlike baking full-sized popovers, the pan does not need to be pre-heated. A mini-muffin pan is used, and the batter is spooned in to fill each cup. They pop up nicely, hold their shape well even as they cool, and they can even be re-heated which I discovered when we snacked on the leftovers. Served warm, these little, bite-sized morsels had a light, golden crust on the outside with pillowy, moist, and savory insides. The amount of blue cheese used here provides just a mild pungency. To my taste, I would actually consider increasing the amount to push that flavor forward. But, if blue cheese isn’t your thing, try these simple, tidy popovers with gruyere or parmigiana reggiano for your next cocktail hour. Saturday evening, a couple of friends joined us for dinner. We were celebrating a backyard project getting off to a great start and autumn’s arrival. Although, you need a calendar to know that it’s fall in Austin because the 90 degree weather is still going strong. We toasted the project, and the good company and conversation far outshone the menu, as they should. Just the same, I’m going to write about the food, and I’ll start with dessert. I tried to choose a somewhat simple dessert. I had hoped that a small piece of tart filled with good chocolate would be a nice ending to a big meal. I took this from Pure Dessert by Alice Medrich. I appreciate Medrich’s precision in her recipe writing. For instance, bittersweet chocolate with 60-62% cacao was listed, and a note was provided for how to change the recipe if 65-72% cacao was used instead. Of course, this should be high quality chocolate. Unfortunately, the definition of chocolate is being reconsidered these days, so referencing the cacao percentage is becoming necessary. 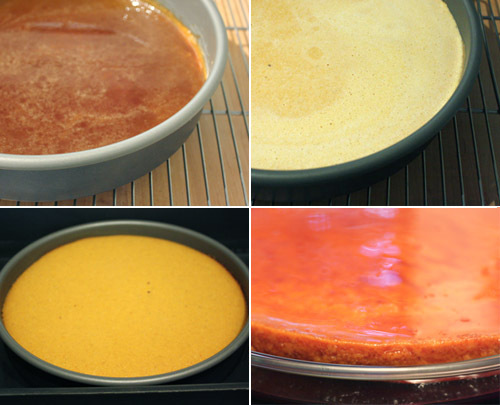 The tart making process was very easy. The dough was made with melted butter, was patted into the tart pan, and was baked and then allowed to cool. The filling contained only chocolate, butter, orange zest, and an egg yolk whisked with boiling water. Medrich mentions, and I agree, that the orange and/or grapefruit used here should be organic so no sprays will be on the zested skin. No sugar was added to the filling, and none was needed. Had a higher percentage chocolate been used, a small amount of sugar was to be added. As it was, it was silky-textured and balanced in flavor with a fresh, citrus note. 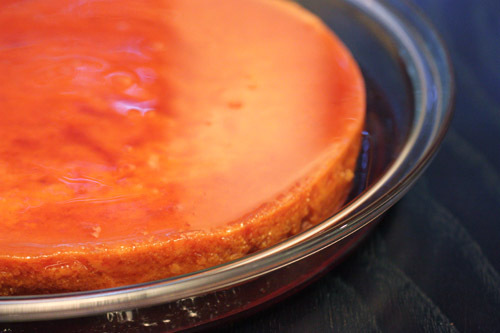 Once filled, the tart was chilled for a few hours. 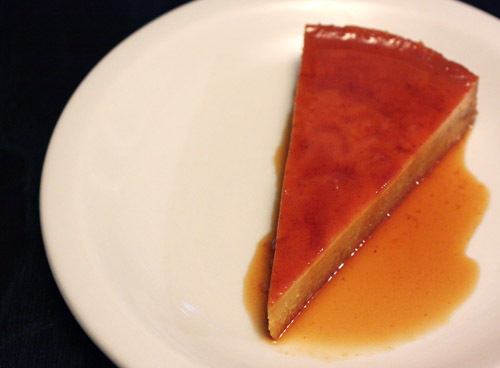 For the topping, jasmine tea leaves were steeped in cream for eight to twelve hours. Medrich notes that the cream should be poured through a sieve to remove the tea after twelve hours even if you won’t be using it yet. I steeped the cream overnight, and removed the tea in the morning. When I tasted the cream at that point, there was a lovely, subtly floral, jasmine presence. However, by the time dessert was served, the jasmine was nowhere to be found. It was a nice addition to the cream, and in the future, I’ll time it so the jasmine tea is removed just before serving. One other point to mention is the serving temperature. 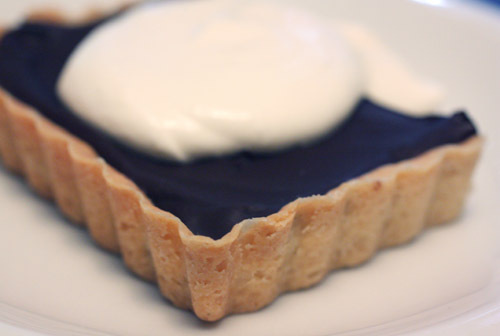 The tart should be removed from the refrigerator about 30 minutes prior to serving so the filling can slightly soften. I failed to give it quite enough time, and the chocolate was a little firmer than ideal. It may seem like I’m nitpicking on several tiny details, but for a dessert like this with so few ingredients, every part of the process matters. 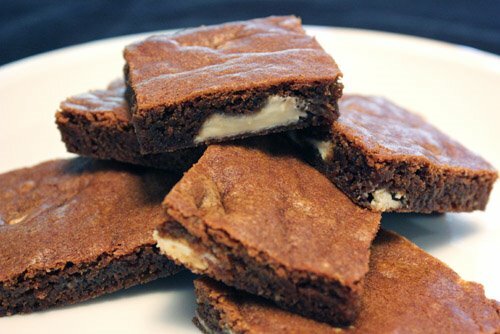 The chocolate has to be excellent, the texture has to be right, and all the flavors have to come together. Then, it becomes just what it was intended to be. The result was very good, but next time I’ll know how to make it even better.